© 2017 Al Hamadi et al. 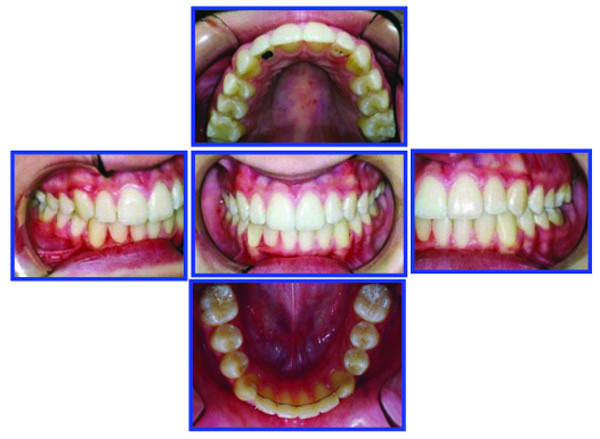 The purpose of this study was to present early and adult cases of anterior open bite that were treated efficiently using different treatment approaches and mechanics. Five patients of different age groups (from 7 to 27 years), suffering from a clear Anterior open bite deformity, were properly diagnosed and relevant treatment modality for each was selected. Positive overbite was efficiently achieved for all patients. Patient compliance is a key factor in using removable habit breakers. However, fixed palatal crib gave the same results but in shorter time. Anterior open bite of skeletal components should be thoroughly evaluated before selecting camouflage or orthognathic surgery treatment modality. Keywords: Anterior open bite, Early treatment, Adult treatment, Surgical correction, Habit breaker, Fixed palatal crib. Early orthodontic treatment is becoming more generally accepted as a means of gaining the greatest possible control over mal-growing dentofacial components including anterior open bite. However, in most cases, a second phase of treatment may be necessary to detail the occlusion and maintain life-long occlusal stability; while in others camouflage or even orthognathic surgery is recommended if standard outcome of facial esthetics and oral function are to be achieved. Speidel et al. in a review of the etiology, diagnosis and treatment of anterior open bite, stated that due to the complexity of etiologic factors of anterior open bite, each individual case requires careful and thorough examination to formulate a proper diagnosis and treatment plan for that patient. In a recent study on Italian preschool children, Silvestrini-Biavati et al. pointed out the fact that non-nutritive sucking habits are essential etiologic factor of developing anterior open bite in deciduous dentition in addition to type of feeding. Gianelly  concluded that 90% of all growing patients can be treated successfully in one-phase protocol if treatment was started in the late mixed dentition. However, the pause between phase I and phase II encountered certain degree of relapse and this led to long-term retention protocol. Pinkham et al. studied the atypical swallowing habits and the role of the tongue malfunction or tongue–thrusting habit in causing disruption of equilibrium of forces between oral and perioral musculature. They concluded that this imbalance may impede eruption of individual or segments of the dentition and consequently causes anterior open bite. However, Proffit and Mason  considered that tongue-thrust habit may be able to sustain open bite but not create it. McNamara and Brudon , and Subtelny  among others reported that if etiologic factors could be recognized and treated early, then it might be possible to minimize or even eliminate most of the developing dentoalveolar deformities. Maciel and Leite  in a review on the etiologic aspects of anterior open bite and their implications to the oral functions reiterated that the therapeutic success of anterior open bite depends on the close collaboration with the otorhinolaryngologist and allergist to eliminate any upper airway respirator obstruction, in addition to other myofunctional and occlusal problems. In another study, NG et al. , addressed the major challenge a clinician encounters when treating anterior open bite which is the patient’s concern about oral function and facial esthetics. They have discussed the non-surgical treatment options of anterior open bite (preventive, interceptive and camouflage) and pointed out to the fact that orthognathic surgery may be the only effective and stable approach left for adult skeletal open bite. Ballanti et al. evaluated the Dentoskeletal features of subjects with AOB in the mixed dentition using both conventional cephalometric analysis and morphometric analysis applied to PA films. Their results exhibited significant shape differences in craniofacial configuration mainly as transverse contraction of the zygomatic region of the maxilla (both skeletal and dentoalveolar) and of the mandible at the condylar and gonial levels. The mandible also showed tendency toward vertical elongation (hyperdivergent) in AOB subjects when compared to control group of normal overbite. Ribeiro et al. reported a successful non-surgical treatment for an adolescent female presented with Angle Class III malocclusion, excessive lower facial height, and anterior open bite. The patient refused the orthosurgical treatment modality and another option was suggested using multiloop edgewise archwire (MEAW) in association with a chincup to correct the divergence of occlusal planes, molar relationship, without major change of the patient’s profile. Zuroff et al. evaluated the post-treatment stability of orthodontic open bite correction after 10 years of retention. Subjects were treated with different nonsurgical modalities. They concluded that it was not possible to predict which patients would yield more stable results when using their pretreatment records. Gracco et al. re-treated a relapsed adult case of anterior open bite non-surgically by resolving the main causative factor that caused the relapse. Head cone-beam computed tomography revealed nasal airway breathing problems due to nasal septum deviation, turbinate hypertrophy, and maxillary sinus congestion. They emphasized on the pretreatment consultation of otorhinolaryngologist prior to considering the treatment of anterior open bite. Leite et al. found that the palatal crib and bonded spurs are beneficial in breaking sucking habits and in maintaining the tongue posture, thus preventing the development of anterior open bite in growing patients. However, fixed palatal crib is more beneficial than removable appliances or bonded lingual spurs as it increases the stability of the dentofacial morphologic correction. A Cephalometric study conducted on 107 school children (77 participants + 30 as control group) by Insabralde et al. elucidated the dentoskeletal effect of removable palatal crib, bonded spurs, and chincup therapy on anterior open bite developed in growing children. They concluded that removable palatal crib and bonded spurs were responsible for dental AOB correction; chincup controlled the vertical development of maxillary molars (intrusion) and relatively reduced the long vertical facial height without significant effect on the dento-alveolar components of AOB. Therefore, chincup should not be used alone but with other appliances to take full benefit of the growing stage skeletally and dentally. The purpose of this clinical study was to present early and adult cases of anterior open bite which were treated efficiently using different treatment approaches and mechanics. Tongue Pressure Prevents Maxillary Laterals from Eruption. The parents’ and patient’s chief complaint was the anterior open bite and facial disharmony. His medical history was good and free from any relevant health problems. In view of the pretreatment records and clinical examination, interceptive orthodontics treatment was recommended using removable Hawley appliance with screening device and habit breaker as shown in Fig. (1). Fig. (1). The sequence of interceptive (Phase I) Treatment: Hawley Removable Appliance with Habit Breaker & Tongue Crib to restore normal tongue position and function. Six months later, an anterior acrylic inclined plane has been constructed to guide the lower anterior teeth into normal overbite and Overjet. case # 1. Phase I early treatment was successful and further follow up confirmed parents’ and patient’s satisfaction. A retention protocol was established to maintain future stability (Fig. 2). Fig. (2). Post phase 1 treatment after 16 months duration, normal development of occlusion in 3Ds was achieved. The extra-oral features were in harmony and balance (competent lips and pleasant facial components). Case # 1. Fig. (3). Pre-treatment records: Extra-oral and Intra-oral features. Case # 2. A female aged 8 years, 2 months, presented with Class I malocclusion and pleasant facial features. Extra-oral examination: The patient had a rounded, symmetric face with incompetent lips where the lower lip is tucked behind the maxillary incisors forcing them labially and the mandibular incisors lingually (Fig. 3). Her past medical history was free from any health problem. Intra-oral examination revealed the following features (Fig. 4). Fig. (4). Pretreatment Cephalometric analysis of skeletal and dento-alveolar components Case # 2. -Max left lateral is partially erupting. -All other teeth are present except third molars. Fig. (5). Pre-Ortho treatment panoramic view. case# 2. The patient's chief complaint was a lack of incising ability with anterior teeth and abnormal lip seal. Fig. (6). Initial interceptive orthodontic appliances in both arches and treatment progress. Case # 2. Fig. (7). Facial & occlusal features (pretreatment, early & end of phase I). Case #2. Fig. (8). End of Phase II treatment showing radiographs, facial & occlusal features. Case #2. Diphasic Treatment of AOB & Narrow Maxilla (Fig. 9). Fig. (9). Pretreatment records: Facial & occlusal features. Radiographs: Ceph analysis & Panoramic. Case # 3. Fig. (10). Sequence of Phase I treatment: RPE (Haas Appliance); Followed by hawley retainer with tongue guard for stability (retention), ready to receive phase II treatment. P.6, case # 3. A female Aged 7y 5M, presented with pleasant face, AOB, incompetent lips, gummy smile, tongue thrust, narrow maxilla and convex mild dolichoface. Her medical history is free from any health problems. Sequence of Phase I Treatment: RPE (Haas Appliance); Followed by Hawley Retainer with Tongue Guard for Stability (retention), ready to receive Phase II Treatment (Figs. 10-12). Fig. (11). Phase II (Comprehensive Ortho Treatment) - June 2003-October 2004 Pre-finishing Stage. Case # 3. Fig. (12). Post-treatment facial & occlusal features. Case # 3. After three years post retention facial & occlusal features (October 2008) (Fig. 13). Fig. (13). Three years post retention facial & occlusal features (October 2008). Case # 3. 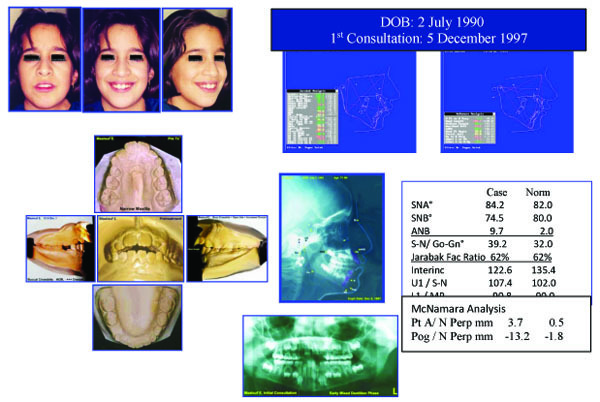 Female: (Age 13 Y + 2 M) 2004, Early Adult Orthodontic Treatment of Anterior Open Bite Cephalometric Analysis (Jarabak & McNamara) (Figs. 14-16). Fig. (14). Pretreatment records: Facial & occlusal features. Ceph tracing & analysis. Case # 4. Fig. (15). Sequence of comprehensive ortho treatment, from habit breaker to detailing of occlusion. Case # 4. Fig. (16). Post Tx: Occlusion & facial esthetics (19 April 2007). Case # 4. 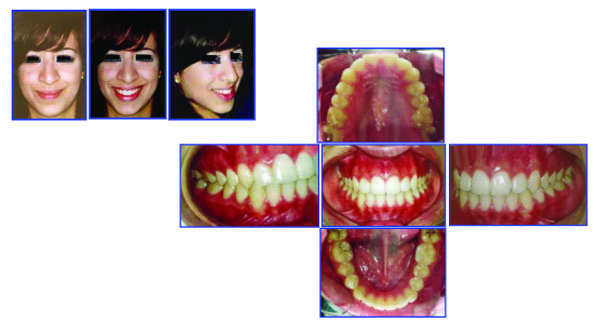 Adult Female 27Y old with sequence of comprehensive ortho treatment of occlusion. Major Extra-Oral Findings (Figs. 17, 18). Fig. (17). Pre-treatment records: Facial & occlusal features. Case # 5. Fig. (18). Radiographic examination: Panoramic & cephalometric analysis. Case # 5. In addition to radiographic examination (Fig. 19). Fig. (19). Pre-surgical orthodontic preparation/ intra-arch levelling & alignment / Occ Plane. Case # 5. The patient was treated with presurgical alignment and postsurgical treatment and evaluated with cephalometric analysis to improve the treatment (Figs. 20-24). Fig. (20). Surgical procedures and post-surgical stabilizing of the occlusion in 3 Ds. Case # 5. Fig. (21). Soft and dentoskeletal tissues improvement post-surgical orthodontics. Case # 5. Fig. (22). Pre treatment profile, soft tissue prediction/ surgical planning and post surgery for case # 5. Fig. (23). Post treatment, facial esthetics & occlusionfor case # 5. Postsurgical orthodontic care to settle the occlusion and maintain future stability of the treatment outcome. Fig. (24). 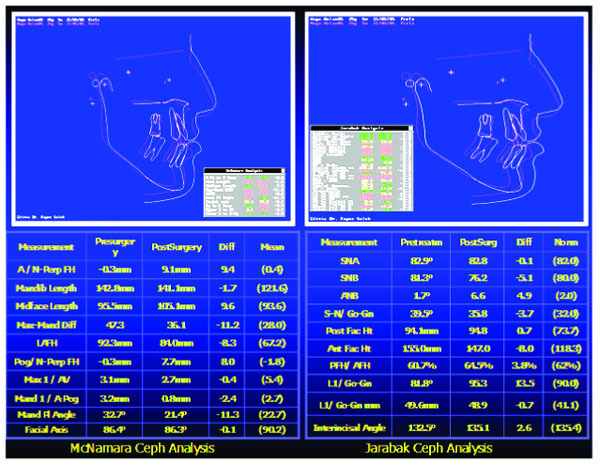 Cephalometric superimposition (McNamara & Jarabak analyses) showing the post-operative improvement of dentofacial features for Case # 5. Each individual case presented in this study required a careful and thorough clinical examination to formulate a proper diagnosis and treatment plan. The first three cases were in the growing age and therefore, early correction of anterior open bite was easier because it is mainly dental in nature aided by greater growth potential of the dental arches (Spidel et al. 1972) . Eliminating any upper airway respiratory obstruction in the late mixed dentition stage also helps to control myofunctional and occlusal problems (Maciel and Leite, 2005) . Monophasic or diphasic early orthodontic treatment depends on the complexity of the deformity where a range of nonsurgical treatment modalities exist as reviewed by NG et al. (2007) . 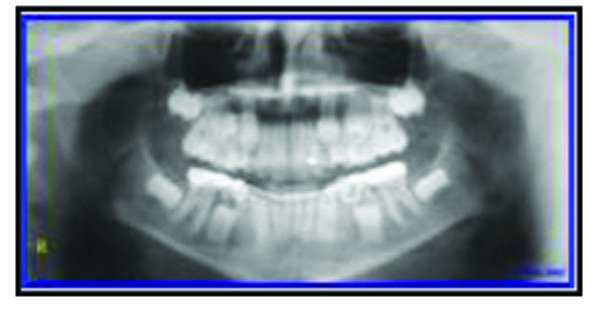 Case # 1 was resolved in one phase early treatment, while the other two cases necessitate a diphasic treatment modality; phase I to resolve the dentoalveolar deformity anterior open bite and phase II to correct any remaining intra and inter-arch discrepancy (Gianelly, 1995)  and (Leite et al. 2015) . The cause and effect debate between tongue–thrusting habit and anterior open bite although not yet resolved, from a therapist point of view, yet early intervention using a simple and efficient appliance (as in case # 1) succeeded in promoting normal growth pattern, correction of the dentofacial deformity and avoidance of relapse, this was confirmed by Insabralde et al. (2016) . Cases # 2 and 3 were planned for diphasic orthodontic treatment to take the advantage of turnover of the growing tissues followed by a pause interval retaining the arch forms and giving chance for the eruption of teeth and their roots formation. Comprehensive orthodontic phase II treatment detailed the occlusion and overcorrected the AOB. Case # 4, an early adult female with all teeth erupted except third molars. Data collection revealed a well-balanced face with a tendency to increase lower anterior facial height, AOB, mild crowding, distorted occlusal planes, tongue thrust habit, and oro-nasal breathing which was resolved prior to treatment as advised by Gracco et al. (2015) , A fixed palatal tongue crib with TPA was constructed to relocate the tongue and expand the buccal segment as recommended by Ballanti et al. (2009) . Leveling arch wires were inserted to level the occlusal plane. Vertical elastics helped to relate properly the arches and stabilize the occlusion, positive overcorrected overbite was achieved and esthetic anterior occlusal plane restored the normal lip-teeth relationship and esthetic smile, according to Zuroff et al. (2010)  positive overbite, breaking the oral habits, and ensured retaining of the treatment outcome are essential to alleviate the concern about future relapse. Case. # 5 (adult female 27 years old), was assigned for combined bimaxillary orthosurgery after thorough examination of the pretreatment records by the health care team. Problem listing revealed a complex open bite, gummy smile, class III malocclusion, long face syndrome, and midline deviation. A realistic treatment planning was formulated aiming to achieve stable, functional, and esthetic results. Presurgical preparation corrected the biologic compensation of occlusal relationship and leveled the occlusal planes to facilitate the mobilization of maxillae into normal skeletal and dental relationship in 3 dimensions, the vertical facial excess was reduced by 8mm and anti-clockwise mandibular rotation by 11.30; in the sagittal direction, the SNB angle was reduced by 5.30 and pogonion point retruded 8mm. The p patient has reported a better self-esteem and satisfaction with the dramatic skeletal, dental, and occlusal improvement. Abraham et al. (2012)  in a similar clinical study emphasized the importance of collaboration of orthodontist, maxillofacial surgeon, and other disciplines to determine the success of orthosurgical outcome beforehand. Despite controversy, successful results are obtained in early treatment. There is no best time of treatment; functional problems should be treated as soon as possible. Treatment objectives must be firmly established; removal of etiologic factors and pressure habits and then correction of skeletal dysplasia. Always inform patients about the possible di-phasic nature of treatment and even orthosurgical correction in adult complex anterior open bite deformity. Further studies are recommended to evaluate relapse tendency and long-term stability of corrected anterior open bite in growing patients. The study was approved by the ethical committee of College of Dentistry, University of Babylon, Hilla, Babylon, Iraq, in accordance with the Declaration of Helsinki. The reported experiments in accordance with the ethical standards of the committee responsible for human experimentation (institutional and national), and with the Helsinki Declaration of 1975, as revised in 2008 (http://www.wma.net/en/20activities/10ethics/10helsinki/). Speidel TM, Isaacson RJ, Worms FW. Tongue-thrust therapy and anterior dental open-bite. A review of new facial growth data. Am J Orthod 1972; 62(3): 287-95. Silvestrini-Biavati A, Salamone S, Silvestrini-Biavati F, Agostino P, Ugolini A. Anterior open-bite and sucking habits in Italian preschool children. Eur J Paediatr Dent 2016; 17(1): 43-6. Gianelly AA. One-phase vs two-phase treatment. Am J Orthod Dentofacial Orthop 1995; 108(5): 556-9. Pinkham JR, Cassamessimo PS, Fields HJ, Mctique DJ, Nowak AJ. Pediatric Dentistry: Infancy through Adolescence 3rd ed. 1999. Proffit WR, Mason RM. Myofunctional therapy for tongue-thrusting: Background and recommendations. J Am Dent Assoc 1975; 90(2): 403-11. McNamara JA, Brudon WL. Orthodontics and dentofacial orthopedics 2001. Subtelny JD. Early Orthodontic Treatment 2000. Maciel CTV, Leite ICG. Etiologic aspects of anterior open bite Antualizacon Cientifica. Barueri (SP) 2005; 17(3): 293-302. Ballanti F, Franchi L, Cozza P. Transverse dentoskeletal features of anterior open bite in the mixed dentition. Angle Orthod 2009; 79(4): 615-20. Ribeiro GL, Regis S Jr, da Cunha TdeM, Sabatoski MA, Guariza-Filho O, Tanaka OM. Multiloop edgewise archwire in the treatment of a patient with an anterior open bite and a long face. Am J Orthod Dentofacial Orthop 2010; 138(1): 89-95. Zuroff JP, Chen SH, Shapiro PA, Little RM, Joondeph DR, Huang GJ. Orthodontic treatment of anterior open-bite malocclusion: Stability 10 years postretention. Am J Orthod Dentofacial Orthop 2010; 137(3): 302.e1-8. Gracco A, Perri A, Siviero L, Bonetti GA, Cocilovo F, Stellini E. Multidisciplinary correction of anterior open bite relapse and upper airway obstruction. Korean J Orthod 2015; 45(1): 47-56. Leite JS, Matiussi LB, Salem AC, Provenzano MG, Ramos AL. Effects of palatal crib and bonded spurs in early treatment of anterior open bite: A prospective randomized clinical study. Angle Orthod 2016; 86(5): 734-9. 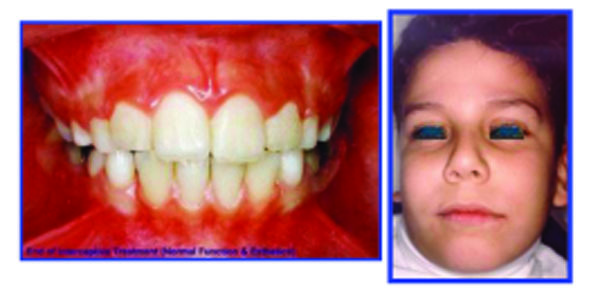 Insabralde NM, de Almeida RR, Henriques JF, Fernandes TM, Flores-Mir C, de Almeida MR. Dentoskeletal effects produced by removable palatal crib, bonded spurs, and chincup therapy in growing children with anterior open bite. Angle Orthod 2016; 86(6): 969-75. Abraham J, Bagchi P, Gupta S, Gupta H, Autar R. Combined orthodontic and surgical correction of adult skeletal class II with hyperdivergent jaws. Natl J Maxillofac Surg 2012; 3(1): 65-9.